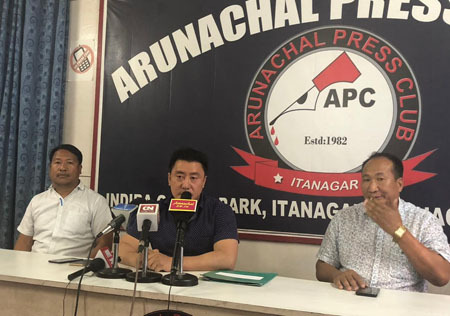 ITANAGAR, Apr 13: Former Yachuli MLA Likha Saaya on Saturday denied allegation that he was involved in the incident involving the damaging of the electronic voting machine (EVM) at the Paniya polling station in Lower Subansiri district on 11 April. Saaya had to issue a clarification after the surfacing of a recorded footage in which a polling officer alleged that Saaya had also come to the polling booth and threatened him. He said he had gone to the polling station to request the polling teams to maintain peace and assist elderly voters who were having problems in casting their votes. “There was no question of my involvement in damaging the EVM,” Saaya said. Saaya, who was one of the star campaigners of the BJP in the western parliamentary constituency, claimed that some youths were provoked by the polling officer, which led to the damaging of the EVM. He also alleged that the polling officer was working at the behest of the NPP candidate. “The NPP’s polling agent, who is himself a close aide of the BJP’s election observer, levelling allegation that I was involved in the damaging of the EVM is uncalled for. It is nothing but an attempt to show me in a bad light before my party high command,” said Saaya.